Ow. Apparently future!Fred thought it was appropriate to knock me to the ground and aim the Rod of Za-Boom in my general direction. Of course, I haven't any idea why he's doing it; nor do I know why neither of us are visible at the moment. These lines are *still* my inner thoughts, by the way. I haven't actually spoken in ages. I suspect that my vocal chords are atrophying. I suspect that I have discovered the only dialogue form more fun to write than iambic pentameter: Gratuitous Japanese, desu. Also, this comic may feature the only instance of justified Gratuitous Japanese ever. Since usually when justified it's no longer gratuitous, deshou? Also also, yes, the party did just fail to seal the plot holes. Again. There is too much convolution to allow for a success. To our heroines Trope-Tan and Jane. And decided to jump back again. I'm really wishing I'd picked a different format for these. It's getting hard to find three words that rhyme and are relevant to the comic. Since some readers (me included) don't know a lick of Japanese, can you provided a translation. Googling the words doesn't work any more. Trope-tan: Thith ith the plathe, dethu! Trope-tan: Okay, let us figure out how to solve this, deshou? Jane: Wait, now your lisp is gone again. Trope-tan: Yeah, most of the time I can work around the shikon nanbutsu. When I'm distracted - say, by *running faster than light* - it's more kurushii to deal with. 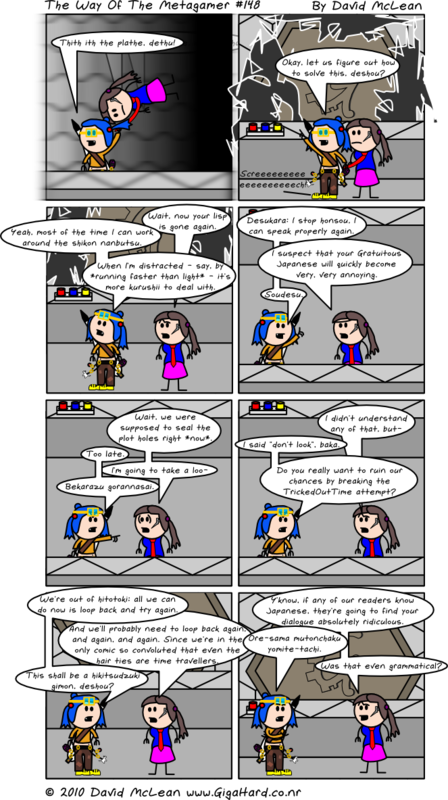 Trope-tan: Desukara: I stop honsou, I can speak properly again. Jane: I suspect that your Gratuitous Japanese will quickly become very, very annoying. Jane: Wait, we were supposed to seal the plot holes right *now*. Trope-tan: I said "don't look", baka. Do you really want to ruin our chances by breaking the TrickedOutTime attempt? Trope-tan: We're out of hitotoki; all we can do now is loop back and try again. Jane: And we'll probably need to loop back again, and again, and again. Since we're in the only comic so convoluted that even the hair ties are time travellers. Trope-tan: This shall be a hikitsudzuki gimon, deshou? Jane: Y'know, if any of our readers know Japanese, they're going to find your dialogue absolutely ridiculous. Jane: Was that even grammatical?